"We are so sorry to hear of Bruce's passing! We will never..."
"Sending my sincere condolences. I am truly sorry for your..."
"Bruce officiated at our wedding at Pemaquid Point..."
DAMARISCOTTA - Bruce A. Bartlett, 85, of Damariscotta, passed away on the evening of March 21, 2019, at the LincolnHealth-Miles Campus following a brief illness. Born in Portland on Sept. 4, 1933, he was the son of the late Ferdinand and Annie (McLaughlin) Bartlett.Bruce graduated from Edward Little High School in Auburn, class of 1951. 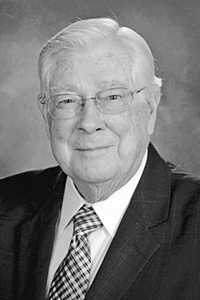 He was hired the next day as a messenger at Manufacturer's National Bank in Lewiston, which started his professional career in banking. Bruce actively served in the Air Force from 1953-1957, and shared fond memories of being stationed in Japan. He returned to his family's homestead in Durham, Maine after his military service. He married Margaret O'Connor of Auburn, on June 24, 1962, and they celebrated 56 years together. Bruce and his family moved to Damariscotta in 1978 where he was employed at the First National Bank of Damariscotta until his retirement. He was a member of Second Congregational Church in Newcastle, where he sang in the choir for 30 years and held numerous administrative positions. Bruce was also a longtime volunteer and patron of Skidompha Library in Damariscotta.Bruce was predeceased by his parents, Ferdinand and Annie; and his brother, Ferdinand Bartlett. He is survived by his wife, Margaret; son, Christopher Bartlett and wife Connie of Eastport, son Craig Bartlett and wife Kristie of Santa Rosa, Calif.; grandchildren, Jamison, Jordan, Mary, Sarah, and Katherine; sisters, Janice Vincent of Tavares, Fla. and Cynthia Autry and husband Lewis of Hopkins, S.C.; and many beloved nieces and nephews. Arrangements are under the direction and care of the Strong-Hancock Funeral Home, 612 Main Street, Damariscotta, ME 04543. Condolences, and messages for his family, may be expressed by visiting: www.StrongHancock.com. At Bruce's request, there will be no service at this time.